Could this truly be real? We’ve had trekker, bicycle riders, and donkey riders traveling long distances to support their favourite politicians. And now, it looks like we have tree climbers. 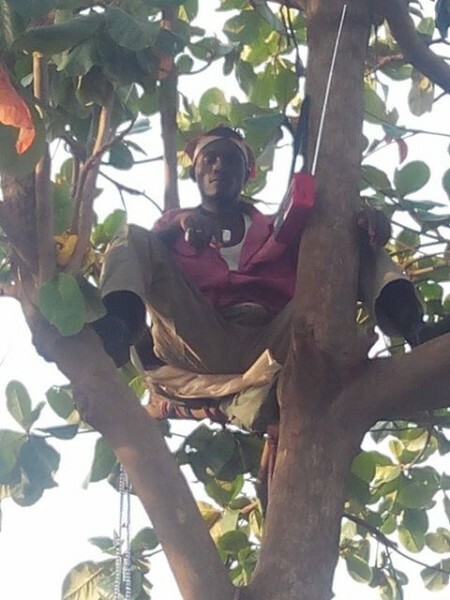 According to some Facebook gist floating around, the man pictured below climbed a tree in honour of president-electMuhammadu Buhari, and says he will not climb down until the new government is sworn in. According to reports, the man is a husband of two and father of five namedMallam Kaura, who climbed a tree at Kantoma in Kurgwi, Quan Pan LGA of Plateau State since Friday 22nd May 2015 and says he will only come down once Buhari comes into power.